This week, September 23rd-29th is Adopt a Less Adoptable Pet Week. Petfinder.com established this annual event in 2009.The purpose of this week is to recognize, and hopefully find homes for, those pets who are seen as “less adoptable”. What makes a pet “less adoptable”? Pets that are considered by society as “less adoptable” are just as loving, sweet, and kind as all of the other pets. However, they aren’t blessed with the natural poster child adoptability as the other pets in the shelter. Many people probably don’t realize that certain types of pets have a harder time finding their forever home, but Petfinder.com discovered that less adoptable pets spend an average of 48 weeks on Petfinder.com where other pets spend about 12.5 weeks. This week is less about the beautiful puppy that with undoubtedly get a home and more about the underdogs and cats in the shelters and rescues throughout the U.S. Here are some examples of pets who are considered “less adoptable” and would love to make this week the week they find their forever home. There are several theories behind the phenomenon that is Black Dog Syndrome (which also applies to cats). Petfinder.com states that Black Dog Syndrome could be due to the following factors; the size of the dog, dimly lit kennels, unclear facial features, and negative portrayals of black pets in books and media. No matter what theory you subscribe to, research supports that black dogs and cats have a difficult time getting adopted. Therefore, this is the week to go down to the shelter and add a black dog or cat to your family! For the life of me, I can’t figure out why senior pets are considered less adoptable. Senior pets may not be able to give you the same number of years that other pets can, but they can give you some of the best years of your life. Senior pets are already house trained and have an attainable level of energy. If you are someone who likes to do the following things; take a nap, go for a leisurely walk, sleep-in, cuddle, hang-out, or watch a movie, then a senior pet is right for you. Special needs pets could come in many different sizes or shapes. The term special needs may sound intimidating to some potential pet parents, but the needs aren’t always what they seem. For example, a cat with one eye is considered special needs. However, her needs are pretty simple, she has just had some challenges in her life, but her quality of life is still great! In some cases, a special needs pet may require an experienced pet owner, so if you fit that criteria, you could provide an excellent home for a loving pet. What can you do to improve the likelihood that these pets will get a home? Share their photos on social media. Social media has helped many pets find their forever homes in recent years. Use your online social presence to bring awareness to the adopt-ability of black dogs and cats, seniors pets, and special needs pets. Educate your friends and family. Knowledge is power, so share it! Tell people about black dog syndrome and the benefits of having a senior or special needs pet by your side! Share your story! If you have shared your life with a black pet, a special needs pet or a senior pet, share your story. Sharing positive stories can help change the stigma associated with these categories of pets. 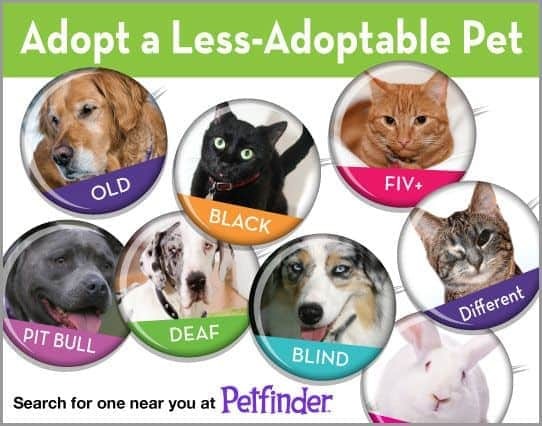 My hope is that 10-20 years from now these categories are no longer considered “less adoptable”. The Vets at FCVC stand ready to welcome your pets with preventive care and maintenance. We understand the special needs of those that are senior, deaf, blind and those that just need a loving environment. Give us a call for your pet care appointment – 970-587-5140. Related articles you may find of interest are Adopting & How it Works, Adopt A Cat (or Dog) and Adopt A Pet Search.